Jeff Smith Landscape Assistance, Inc. is a full-service landscape design and installation company serving the San Diego community. We have over 40 years of experience creating San Diego landscapes. Whether your project is large or small, Landscape Assistance can help you create your ideal outdoor oasis. 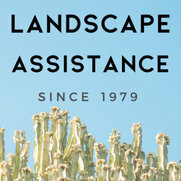 Landscape Assistance is committed to delivering a full range of custom landscaping services to our North County-based residential and commercial clients. Insured, bonded and licensed by the state of California, we are experienced in landscape design and contracting. We are here for our clients, both residential and commercial, from concept through installation.